As we've pointed out before, Siri has been losing ground in the virtual assistant race, surpassed by Alexa and Google Assistant. Last weekend, we told you that Siri co-founder Norman Winarsky blames Apple for taking what was originally devised as a travel and entertainment concierge app, and turning it into a digital helper for all iOS users. This morning, a published report contains comments from former Apple employees commenting on Siri. The report gives the late Steve Jobs credit for having the vision to put Siri on the iPhone. 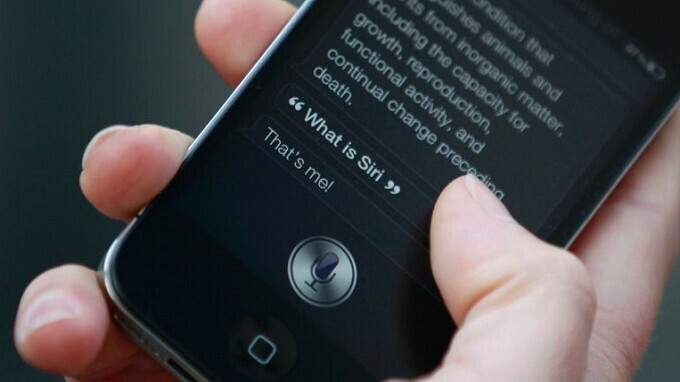 Apple purchased Siri on April 8th, 2010 for $200 million, and inside Apple a debate started brewing about what would be the best way to employ the virtual assistant. One group felt that Siri should quickly and accurately give responses to information requests, while the other group wanted Siri to perform complex tasks. The virtual assistant debuted on October 4th, 2011 when the Apple iPhone 4s was introduced. However, Jobs died the very next day leading one former employee to say that with the death of the one man who had a vision for Siri, Apple had to fly by the seat of its pants. "They didn't have a big picture," said the ex-Apple employee. A recent survey found that Siri trailed Google Assistant when it came to accurately answering questions in five different categories (Local, Commerce, Navigation, Information and Command). Siri trailed Alexa and Cortana in three of the categories (Navigation, Information and Command). Part of the reason that Siri is struggling might have to do with a surprising lack of developer interest, even though Apple opened up its virtual assistant to third party developers with iOS 10 in 2016. They basically just gave up on improving it. On the other end though, I have issues with the way my information is handled through google services. I completely agree with you on bixby. The button makes the usage very easy for start and stop. As an IOS user, I envy bixby when my friends use it. "...lost with the death of Steve Jobs" Same can be said for a few of the iPhone models. If Jobs was still here I'm not sure if certain aspects of Android would've caught up & surpassed iOS the way it has. On the flip side, it also would have forced certain developers and manufacturers to hurry up and play catch-up to Jobs because of the way he thought. - Typed on my Galaxy Note 8. There’s no need to give up on Siri. I use it for playing music through Apple Music, set alarms and timers, turn on or off Bluetooth/WiFi/do not disturb mode, however it fails to call someone with error which says “sorry, I cannot call using that number” and could never solve this problem. Siri just isn't anywhere as good as Google Assistant. Even Voice Assistants such as Alexa and Bixby are simply superior. You can make up all kinds of reasons as to why Siri is so much worse, but that is irrelevant, as i doesn't change the user experience in the end. It seems like Siri had a good start compared to other voice assistants, but then it just stagnated completely, while the others improved quite dramatically. It definitely seems like their loss of vision completely stagnated improvements for Siri. It's going to take quite some time for them to catch up, even if they start picking up speed. It is not just Siri alone Apple also lost vision with iPhone and iOS since Job's death. Job already planned ahead with iPhone 5s, 6, 6s, and 7. After that Cook is credited for destructive ios12, ugly notched iPhone X and no-vision-recycling iPhone 8. I literally just only use Siri to ask about the weather and set alarms for me. Apart from that, I just don't bother opening. For me, Apple died with Steve Jobs. I remember how simple, clean and absolutely minimalistic iPhones used to be before iOS6. I remember picking up a 3GS at a demo shop ages ago. The UI had no learning curve and I mastered it im just a few moments. Can't forget how complex my Blackberry felt afterwards! And that exactly was Jobs' vision. Deplorable Siri. Buggy and ugly iOS11 and an eye sore of a flagship device are pretty telling about the direction Cook is leading Apple. And then there are iPads, iPods and Macs which are in steep decline for multiple years now. Oh well, G'Day! Apple lost its vision not long after Steve passed.